Product categories of Fiberglass Silicone Baking Mat, we are specialized manufacturers from China, Fiberglass Baking Mat, Silicone Baking Mat suppliers/factory, wholesale high-quality products of Silicone Pastry Mat R & D and manufacturing, we have the perfect after-sales service and technical support. Look forward to your cooperation! Packaging: Each piece per poly bag and packed in one carton. Wholesale custom fiberglass Silicone Baking Mat set ,washing microwave safety. You can decorate your sweet party. If friends come, your can DIY interesting cakes or desserts, making a big suprise for your friends and children. Durable, Flexible, High Quality: You can freeze, refrigerate, prepare and even knead or cook on our silicon baking mats. Superior flexibility helps our silicon baking mat STORE EASILY, even in the tiniest kitchens. Sustainable and Safe: Our fiberglass silicone baking mat set are easy to clean-up, killing the need for strong soaps and detergents, which this NONTOXIC, NONSTICK, SAFE COOKING SURFACE doesn't require. Tasty Treats Slide Right Off: Baking cookies, pizza, and even cheese crisps has never been easier. Our naturally nonstick fiberglass Silicone Baking Mats make sure even caramelized sugar and gooey cheese slide right off. 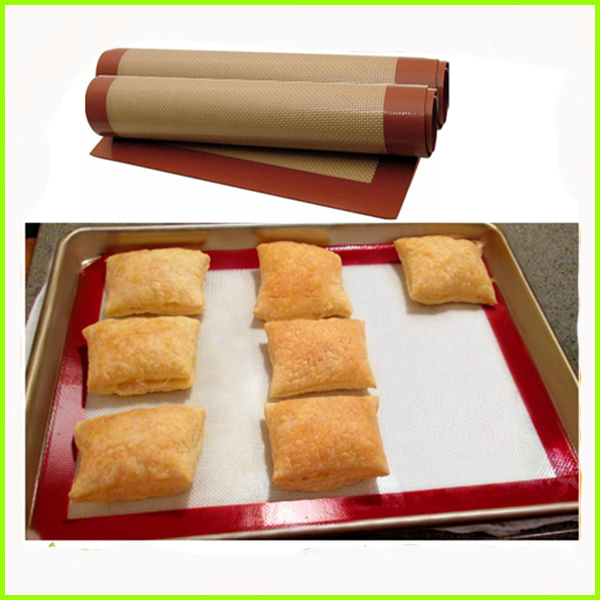 Saves You Money and Improves Your Health: Eat healthier and enjoy having a little more spending cash by using our fiberglass silicone baking mats set - you'll never need messy sprays, expensive parchment paper, or unhealthy grease again. Back, No Hassle, LIFETIME GUARANTEE: We don't sell anything we haven't tested ourselves - love our fiberglass silicone baking mats set or get every penny back. It's that easy.